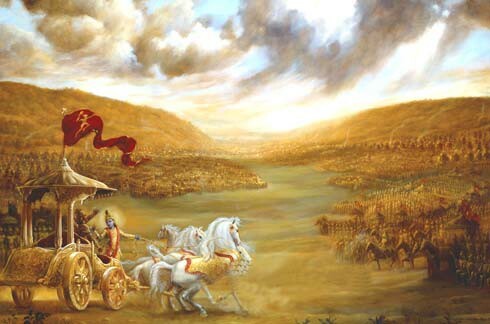 The Gita is a wisdom dialogue of a non-religious and non-obligatory, contemplative and philosophical order, consciously and artfully inserted in the heart of the great epic called the Mahabharata by the ancient Sage-Bard Vyasa; in which the rarest of possible coincidences called absolutely just war is taken as presenting itself to be fought by its central character, Arjuna, who, being a sensitive and contemplatively disposed type of soldier, is about to adopt a negative, escapist attitude of regret and retrospection when it was actually too late for him to extricate himself from the situation that had already assumed a harsh and imperatively necessary character. Arjuna suffered from a self-pity, regret or mystical agony, blurred his outlook, making him claim prematurely the high virtue of renunciation while still given to relativist patterns of thinking altogether incompatible with the thoroughly absolutist philosophy and way of life that the Gita brings out through the words of Krishna as representing the Guru and Absolute at once. Krishna, who, besides being the Guru, is also relation, friend and charioteer of Arjuna, takes every possible measure at every possible level of life, to remove the philosophical doubts, religious scruples and psychophysical inhibitions which dimmed Arjuna’s vision and clogged his spirit. Eloquently and in elevating language, Krishna preaches that rare type of unitive wisdom or Absolutist way of life known as Yoga, a mystical and intuitive path of contemplative dialectics. Established in this unitive way by which inner and outer factors of life are equalized, harmonized or neutralized, Arjuna is able to get rid of superstitious repressions and conflicts. He regains normality of outlook as a true yogi who does not particularly wish to avoid war when it is absolutely necessary, just and conducive to general happiness. Whether he adopted the way of quiet contemplative retirement portrayed in the last chapter or whether he engaged in harsh warfare is left an open question by Vyasa. Before the epic moves onward in its grand heroic pace again, we find Arjuna a fully disillusioned contemplative ready to affiliate himself wholeheartedly as one of the counterparts of a contemplative situation in which Krishna himself is involved as representing the supremely Absolute Value.